Dairy Free and Gluten Free Cornbread Muffins made with ground oats – soft, moist & easy to make! It’s been a minute since I’ve had something soft and slightly sweet to go with my morning coffee so these Gluten Free Cornbread Muffins just had to be done. With blueberries! Since it’s summer and all…. 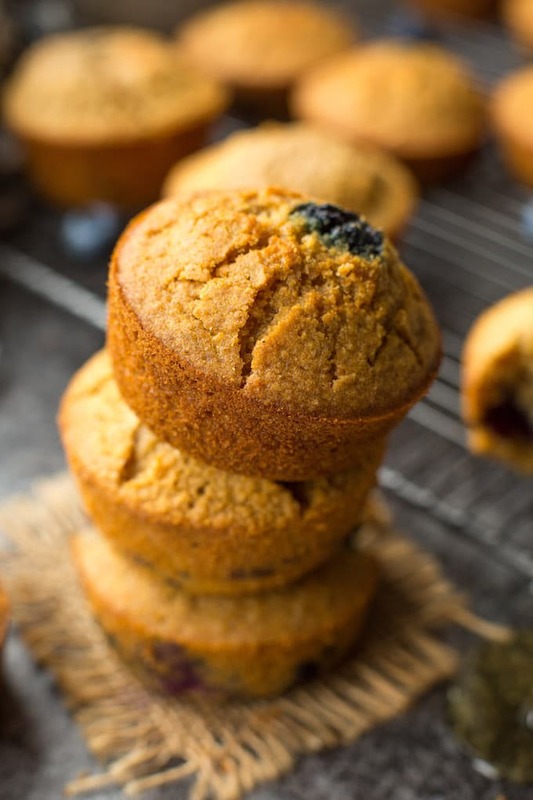 These muffins are made with a blend of cornmeal and oat flour. If you don’t keep oat flour on hand you can always make your own by grinding up rolled or quick oats up in food processor or strong blender. The base of the batter is made up of coconut milk, an egg & a dairy free buttermilk. If you can tolerate dairy you can use greek yoghurt in place of the coconut milk & a regular dairy buttermilk instead. In order to make these dairy free we’re going to make a dairy free buttermilk from scratch – if you’ve never done it before it’s very simple and it’s the same way you’d make a dairy buttermilk. Just combine 1 cup of your favourite dairy free milk with 1 tablespoon of lemon juice or vinegar (like an apple cider vinegar or white wine vinegar). Stir it together and set aside while you prep the rest of your muffins. After a few minutes your milk will look slightly curdled which is how you know you’re ready to go. 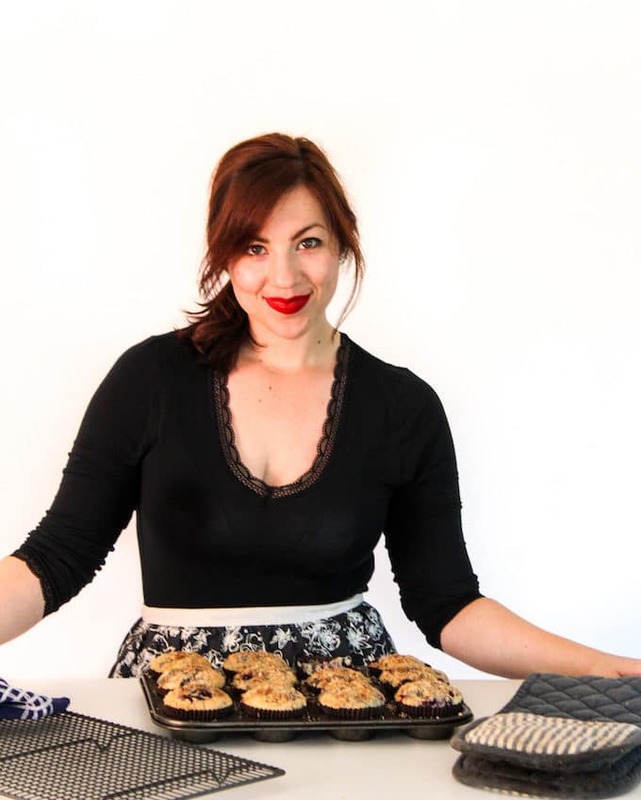 All in all these muffins are super easy to make require just one bowl and 10 minutes! 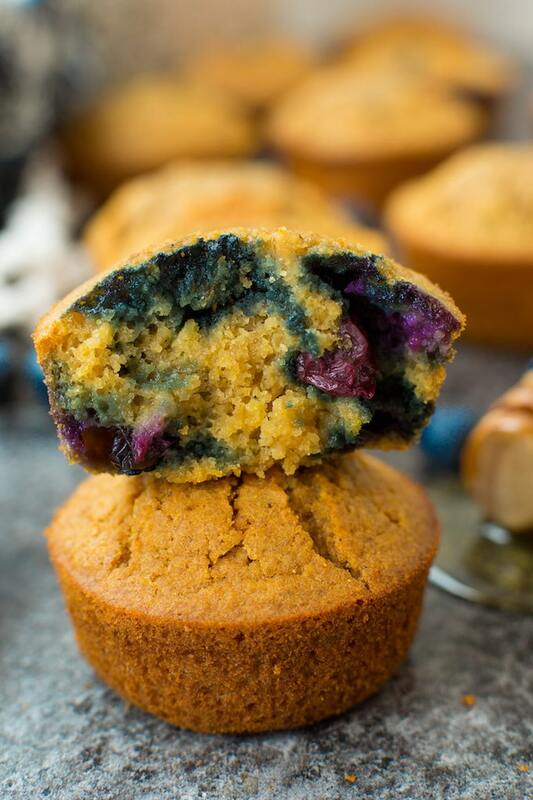 Don’t forget to #asaucykitchen on instagram if you try these Gluten Free Cornbread Muffins! I’d love to see what you make with it! You can also post your pictures to my facebook page! Dairy Free and Gluten Free Cornbread Muffins made with ground oats - soft, moist & easy to make! Preheat oven to 425°F/220°C. Line or grease 12-count muffin pan and set aside. In a large mixing bowl whisk together the cornmeal, oat flour, baking powder, baking soda and coconut sugar. Whisk in the honey, coconut cream, and egg until combined and no lumps remain. Whisk in the buttermilk. Finally stir in the blueberries. Spoon the batter into the prepared muffin tins filling all the way. Bake for 5 minutes at 425°F/220°C. Without opening the oven, reduce the heat down to 350°F/180°C and continue baking for another 15 minutes or until fully baked in the centre. To check for doneness insert a tooth pick or knife into the middle of a muffin - if it comes out clean it's done. Let the muffins cool in the tray for about 10 minutes and then enjoy! To make a non dairy buttermilk: measure out 1 cup non dairy milk with 1 tablespoon fresh lemon juice or vinegar (white wine vinegar or apple cider) and let stand at least 5 minutes. Your milk should start to look a little curdled. If you don't have oat flour on hand you can make your own by blending whole oats in a blender until you get a fine powder. You can also sub greek yogurt for coconut milk and gluten free all purpose flour for oat flour.